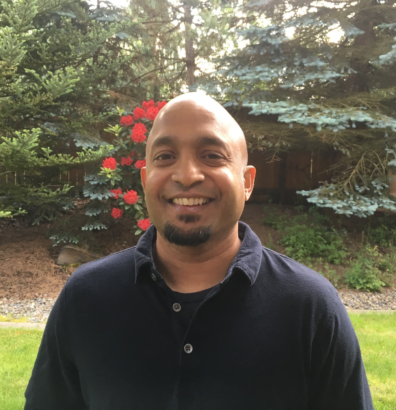 WSU Puyallup is very excited to congratulate Ani Jayakaran for being one of two CAHNRS faculty to be awarded a WSU Grand Challenge Research Seed Grant. University wide the seed grant competition garnered 150 letters of intent and 41 full proposals, though only 10 total projects were selected. Ani is an associate professor at Puyallup Research and Extension and is the lead on the project, “Optimizing GSI efficacy by integrating hydrologic, cultural, and socioeconomic elements in a watershed spanning the urban-agriculture continuum.” Collaborating investigators on the project are Joan Wu and John Stark (WSU – Puyallup), Michael Sánchez, Jolie Kaytes, Michael Brady, Danna Moore and Stephanie Hampton (WSU – Pullman) and John Harrison (WSU – Vancouver). Green Stormwater Infrastructure or GSI has been shown to have a number of benefits for an ecosystem by reducing stormwater runoff, providing food (urban and urban rooftop agriculture), reducing the urban heat island effect, reducing energy costs (green roofs and living walls), and recent research at our center has revealed it could also protect aquatic food sources. The project will study the best placement, utility, and sustainability of these Green Stormwater Infrastructures—such as bioretention, green roofs, and cisterns— within urbanized landscapes. Aside from the environmental impact, this project will also provide a learning laboratory for students and develop a framework to inform GSI choices and location on the landscape, using a watershed as the planning unit. The goal of Ani’s project is to show that a greater understanding of critical factors that govern GSI placement at a watershed-scale is essential for sustainable resource management, benefitting both humans and ecosystems. All of us at the center are excited to see where this project takes him.